Amateur radio is a hobby that involves experimenting with radio (and related technologies like television or radar) for fun and education. It is also known as “Ham Radio” and radio amateurs are sometimes referred to as “hams”. Like most hobbies, there are many different activities that fall under its umbrella. Using radio to communicate with other amateurs is one of the foundations of the hobby. Most amateurs have a radio station of their own, but radio clubs often establish stations for communal use. Increasingly, shared stations can be accessed via the Internet so that participants can access the station from any convenient location. Stations could range from very simple to very elaborate. A combination of a transmitter and a receiver is known as a transceiver. Handheld transceivers are available for talking to others in the same town, while small transceivers suitable for portable or mobile use can achieve world-wide communication. Antennas make a huge difference to the results, and can range from a simple arrangement of wires to huge antenna farms featuring several tall towers. Radio amateurs communicate in many different modes. The term refers to the way information is encoded onto the radio signal. Radio signals started with Morse code telegraphy, where the radio signal is simply switched on and off in accordance with a standard code. This mode is known as Continuous Wave (or CW), and is still popular in amateur radio after more than a century. Phone is a collective term for any speech-based modes, including FM, AM and SSB, where a normal human voice is transmitted via radio and interpreted by ear. Finally, many digital modes allow data to be transmitted via radio. These include FSK, PSK, WSPR, WSJT, SSTV and many others. These modes allow the transmission of text and pictures, much like the Internet does. Don’t worry too much about these terms; their meaning will become clear later. Amateur radio contacts (also known as QSOs) range from the briefest exchange of callsigns lasting mere seconds to long conversations (known as rag-chews) that may last hours. Amateur radio is not like the phone system since you generally can’t contact a particular station on demand. If you want to speak to a particular person, you must agree to a time and a frequency where you will meet. Such an arrangement is known as a schedule, or “sked” for short. Even then, there is no guarantee that propagation will allow the stations to hear one another. Otherwise you can just speak to whoever happens to be listening and is interested in a chat, which is a great way to meet new friends and learn new things. There are also some regularly scheduled networks (or “nets”) where operators who share a common interest get together at a particular time and frequency to exchange ideas. After communicating with another amateur station, it is customary to send a confirmation in the form of a QSL card. This card is a postcard with information about yourself and your station, and details of the QSO such as the date, time, frequency, mode and the callsign of the station worked. Many amateurs take a great deal of pride in their QSL cards, which are often works of art. As well as being something to display and a nice reminder of the contact, QSL cards are required if you wish to claim a contact for an award (see below). At the end of the twentieth century, several electronic replacements for QSL cards started evolving. The most important of these, the Logbook of the World, confirms the correctness of contacts, but does not include facilities for pictures. As a result, many other systems have sprung up, with eQSL.cc perhaps being the most popular. Many amateurs build at least some of their equipment. Some build equipment from purchased kits or from plans found in amateur radio magazines or on the Internet. Others build their equipment from scratch, doing all the necessary design and sourcing the components themselves. The complexity ranges from simple projects, such as a computer soundcard interface that can be built in an evening, to complete radio transmitters and receivers that may take months or years of work. Today, microprocessors and digital signal processing (DSP) is an increasingly important part of the hobby, so building equipment may also involve writing the necessary micro-controller or DSP programs. Of course, for those who do not enjoy electronics, everything you need to participate in the hobby can be purchased off the shelf. Many amateurs find the complexity of modern transceivers to be beyond their construction capabilities. However, antennas provide a ready target for experimentation. Simple antennas can be made with string and wire, and more elaborate installations can include heavy hardware and advanced automation. Most amateurs build at least some of their own antennas. Antenna projects can be very rewarding as good results may be obtained from fairly simple designs. A number of software packages allow you to design an antenna and model its performance before you invest in the construction of the antenna. 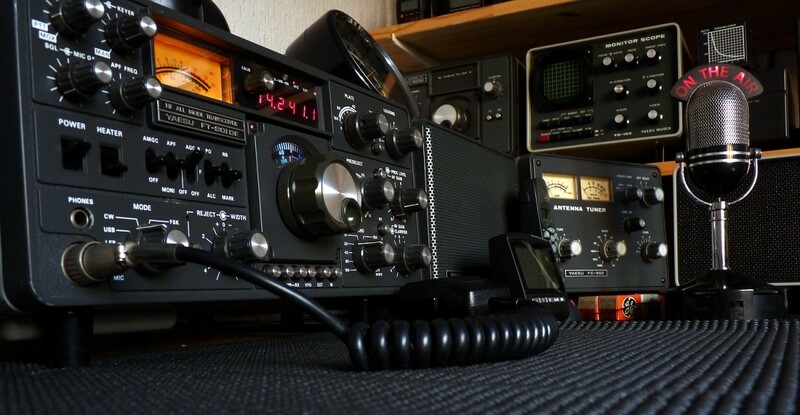 Radio amateurs have a proud history of making their skills and equipment available for public service and emergency communications. On the public service side, amateurs provide communications for many sporting events such as rallies, marathons and cycle tours where their ability to communicate effectively from remote places is of great assistance to the organizers. Many amateurs also ensure that their radio stations have some alternative power source, such as batteries, a generator, or solar power, so that they can continue to provide communications in the event that the telephone and power distribution systems are disrupted by a natural or manmade disaster. In South Africa, Hamnet, a special interest group of the South African Radio League, coordinates amateur emergency communications. “DXing” means communicating with as many different places as possible, often in order to qualify for certificates and awards. The term comes from the use of “DX” as a telegraphy abbreviation for “long distance”. There are many different awards, mostly in the form of a handsome certificate. Some of the harder awards also include a trophy or plaque. Major awards include: The premiere award is the DX Century Club (DXCC), which requires proven communications with at least 100 different countries. Worked All Zones (WAZ), for proven contacts with all 40 CQ Zones. Some zones are easy, while others are sparsely inhabited or challenging propagation. Because DXers are always on the lookout for countries, islands, mountains or provinces that they have not worked before, there is often a flurry of interest and activity when a rare country or island is activated by some intrepid radio amateur. Expeditions to unusual places for the purpose of setting up and operating a radio station there are called “DXpeditions”, and participating in DXpeditions is itself a very rewarding and challenging activity. Contests bring out the competitive nature of some radio amateurs, who enjoy the challenge to contact as many different stations as possible over a predetermined period of anything from an hour or two up to 48 hours or more. Contests may be run on a local, national, regional or international basis and may attract anything from 10 to 5000 contestants. Many contests have several entry categories to allow similarly equipped stations to compete with each other. The amateur community has successfully launched a number of small communications satellites for the use of radio amateurs around the world. Communicating with other amateurs via satellite (or via the earth’s natural satellite, the moon) gives radio amateurs an unparalleled opportunity to learn about the technology that underlies much of the modern era of communications. Because amateurs themselves develop these satellites as a cooperative, non-profit venture, those who are interested in the design and construction of satellites also have the opportunity to study the designs and may eventually be able to contribute to new amateur satellite projects. The maritime and off-road communities are increasingly turning to amateur radio for their communication needs. Thousands of small craft such as yachts make use of the services provided by maritime nets which pass on weather reports and crucial safety information, allow mariners to access email and assist in the search for missing boats. Off-roaders who venture into uninhabited areas can also benefit from amateur communications, both between vehicles within a party and also back to a “home base” or to summon assistance in an emergency. The Radio Regulations include some restrictions on the use of an amateur radio station. It is important that you understand these in case you find that what you had planned to do with your amateur radio license is not permitted! Amateur radio stations may not be used for broadcasting. Amateur radio is intended for direct “one-on-one” communications with other amateurs, and not as a community broadcasting service. Amateur radio stations may only transmit music under very specific conditions, which are intended to ensure that they do not become pirate broadcast stations. No products or services may be advertised on amateur radio. Amateur radio stations may not transmit messages for reward. Amateur radio stations may not be used to transmit business messages that could be sent using the public telecommunications service. Amateur radio stations may not be used to transmit indecent, offensive, obscene, threatening or racist comments. Amateur radio stations may not be used to pass third-party traffic (in other words, messages that originate from anyone other than the amateur who is operating the station) except during an emergency. This chapter briefly outlines what amateur radio is all about, what the license requirements are, and what legal restrictions there are on what can be transmitted by amateur radio stations. I hope you have decided that amateur radio is a hobby that you wish to participate in. Welcome you to the amateur community! We hope that you will find this course interesting and worth your while.